Manchester bombing: British police furious over US leaks – Royal Times of Nigeria. British police suspend sharing of intel info with US over leaks: Above An injured person at the Manchester Arena. British police have stopped sharing information on the suicide bombing in Manchester with the United States, the BBC reported on Thursday, because of fears that leaks to the U.S. media could hinder a hunt for a possible bomb-maker still at large. The row came as police pressed a fast-paced investigation into Monday’s bombing, which killed 22 people at a music venue packed with children and raised fears a further attack could be imminent. Troops have been deployed to guard key points and eight people have been arrested. Authorities have said the 22-year-old bomber, British-born Salman Abedi, was part of a network and had recently returned from Libya, where his parents were born. Police chiefs have made clear they are furious about the publication of confidential material in U.S. media, including bomb site photographs in the New York Times, saying such leaks undermined relationships with trusted security allies. “This damage is even greater when it involves unauthorized disclosure of potential evidence in the middle of a major counter-terrorism investigation,” a National Counter Terrorism Policing spokesman said in a statement. British Prime Minister Theresa May will raise the issue with U.S. President Donald Trump when she meets him at a NATO summit in Brussels later on Thursday, a government source told Reuters. The Financial Times reported that such images are available across a restricted-access encrypted special international database used by government ordnance and explosives experts in about 20 countries allied with Britain. It said the database was built around a longstanding U.S.-British system. The BBC said Manchester Police hoped to resume normal intelligence relationships soon but was currently furious. 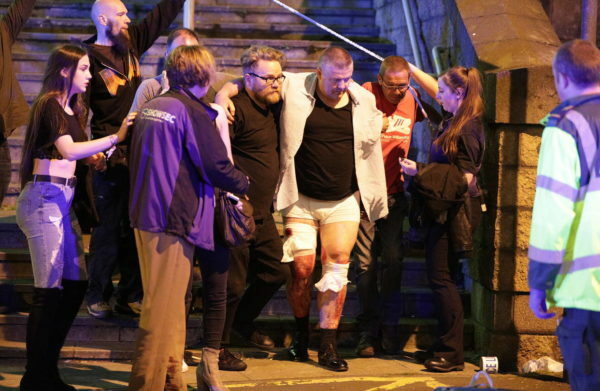 The bombing, which took place at the Manchester Arena indoor venue just after the end of a concert by U.S. pop singer Ariana Grande, was the deadliest in Britain since July 2005, when 52 people were killed in attacks on London’s transport network.